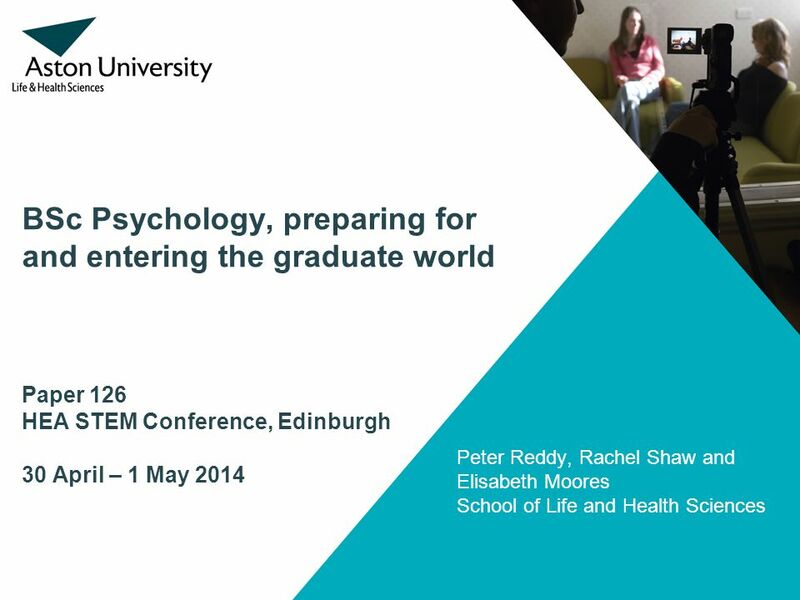 BSc Psychology, preparing for and entering the graduate world Paper 126 HEA STEM Conference, Edinburgh 30 April – 1 May 2014 Peter Reddy, Rachel Shaw and. 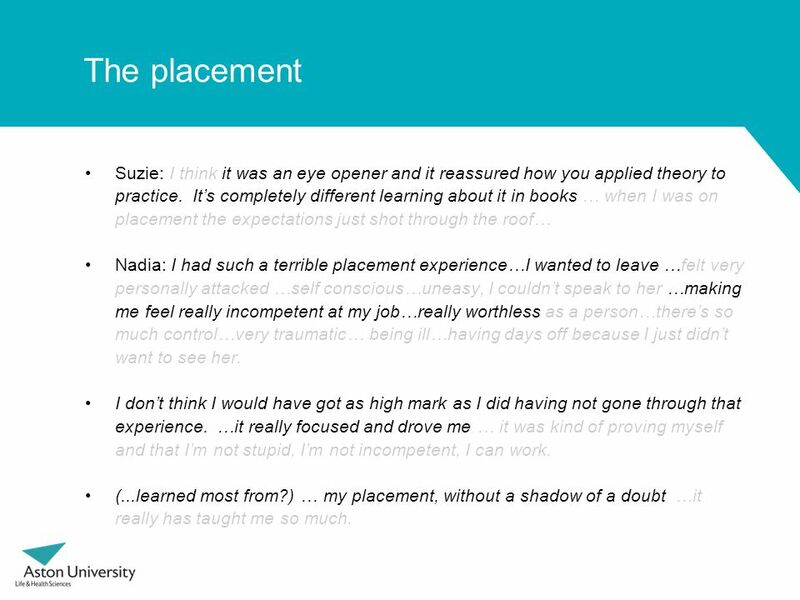 4 The placement Suzie: I think it was an eye opener and it reassured how you applied theory to practice. It’s completely different learning about it in books … when I was on placement the expectations just shot through the roof… Nadia: I had such a terrible placement experience…I wanted to leave …felt very personally attacked …self conscious…uneasy, I couldn’t speak to her …making me feel really incompetent at my job…really worthless as a person…there’s so much control…very traumatic… being ill…having days off because I just didn’t want to see her. I don’t think I would have got as high mark as I did having not gone through that experience. …it really focused and drove me … it was kind of proving myself and that I’m not stupid, I’m not incompetent, I can work. (...learned most from?) … my placement, without a shadow of a doubt …it really has taught me so much. 5 Expectations Nadia: –… so I started working and I absolutely love it …and I no longer feel like a student …I’m really looking forward to like my journey into like the world of working, finding a career, doing something that I enjoy and I’ve got my first pay cheque as well, brilliant. –…meeting people and feeling like an adult and …I’m really, really enjoying it. 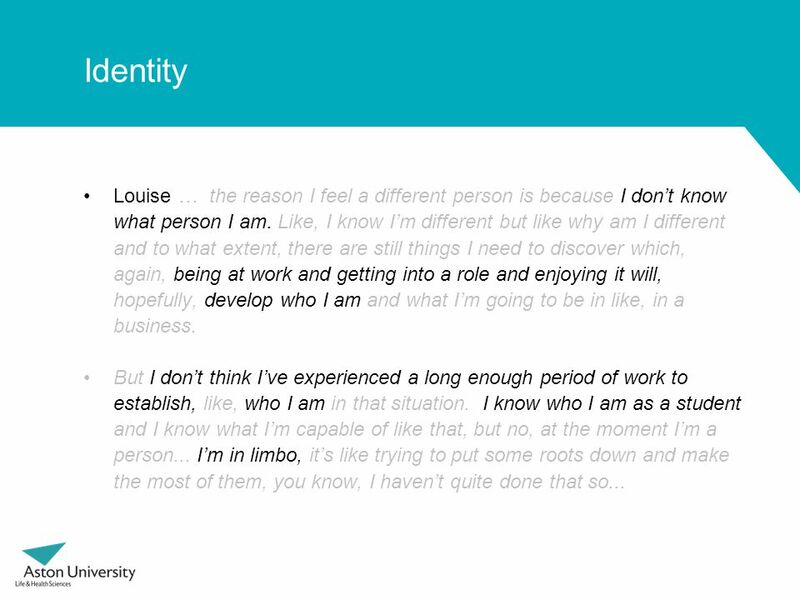 Louise: –… with the placement … I had a lot more support because it was almost like [the university] had instigated that placement … you’re coaxed into it, there was a of build up to it and so it was almost like I was guaranteed to get that placement….. I did visit the careers service a fair few times … but it was almost like, it was you know, it was down to me to find a job. 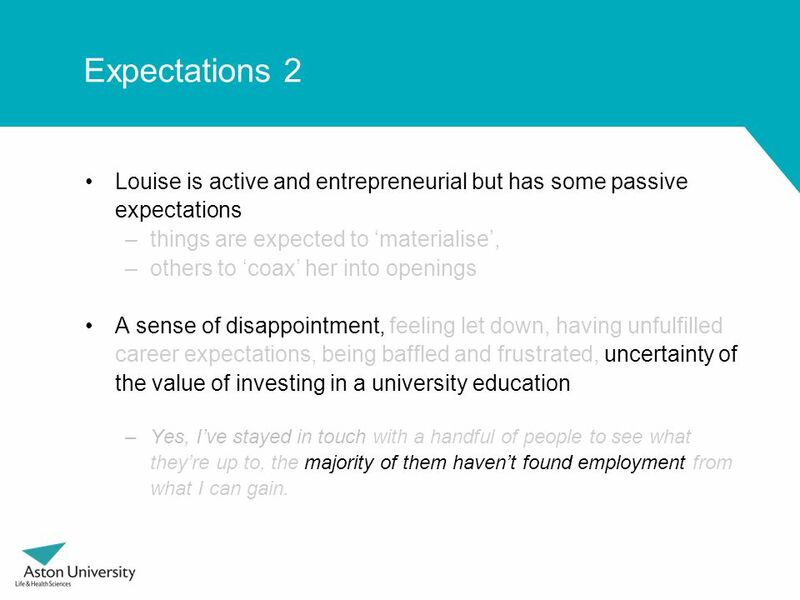 6 Expectations 2 Louise is active and entrepreneurial but has some passive expectations –things are expected to ‘materialise’, –others to ‘coax’ her into openings A sense of disappointment, feeling let down, having unfulfilled career expectations, being baffled and frustrated, uncertainty of the value of investing in a university education –Yes, I’ve stayed in touch with a handful of people to see what they’re up to, the majority of them haven’t found employment from what I can gain. 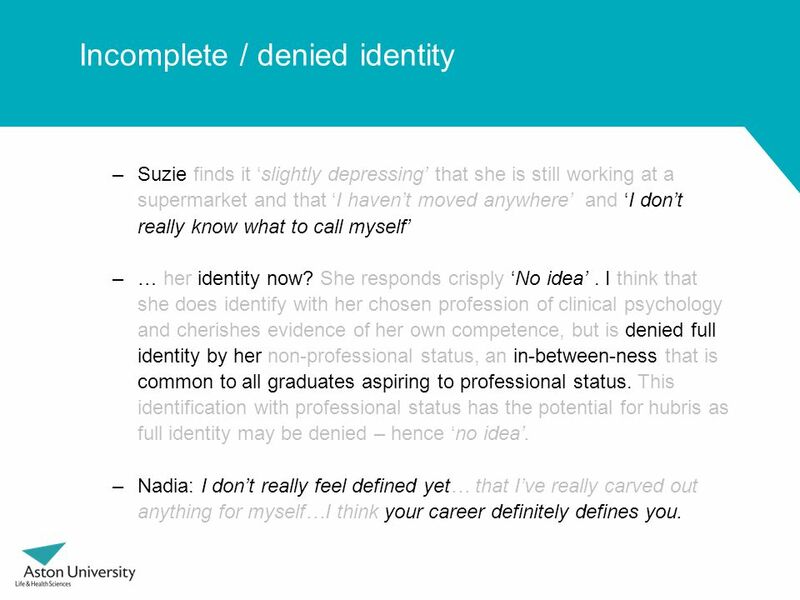 9 Incomplete / denied identity –Suzie finds it ‘slightly depressing’ that she is still working at a supermarket and that ‘I haven’t moved anywhere’ and ‘I don’t really know what to call myself’ –… her identity now? She responds crisply ‘No idea’. 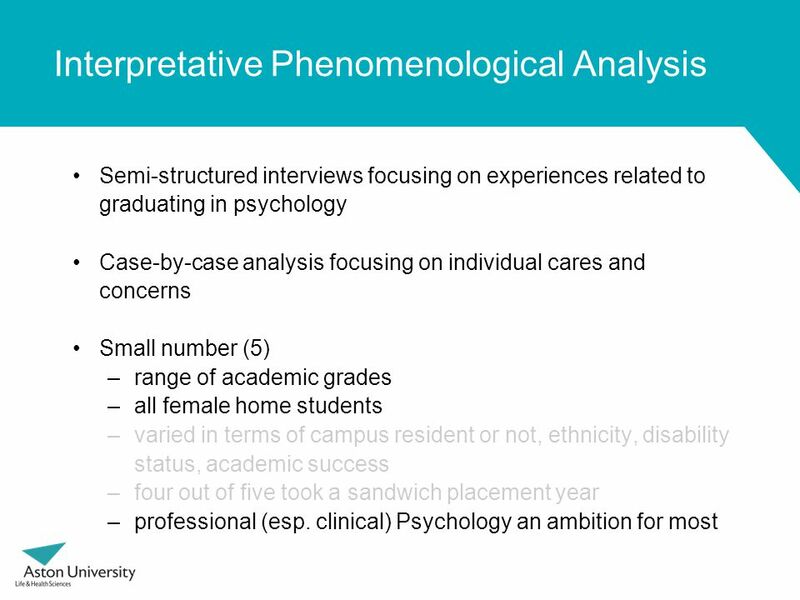 I think that she does identify with her chosen profession of clinical psychology and cherishes evidence of her own competence, but is denied full identity by her non-professional status, an in-between-ness that is common to all graduates aspiring to professional status. This identification with professional status has the potential for hubris as full identity may be denied – hence ‘no idea’. –Nadia: I don’t really feel defined yet… that I’ve really carved out anything for myself…I think your career definitely defines you. 10 Becoming Nadia: I was so scared initially. … because I was thinking I don’t know what I want to do… I’m having to learn to become a little bit more chilled out and just let things be …and in a couple of year’s time you might not want to go down the career you wanted to at 22, and that’s fine… … it’s the pressure from everybody else as well …. as soon as you leave it's like, ok, what are you going to do… They’ll want to know everything… your whole 10 year 15 year life plan… and they just think well why did you do psychology … I don’t have all the answers yet and it’s ok not to have all the answers. 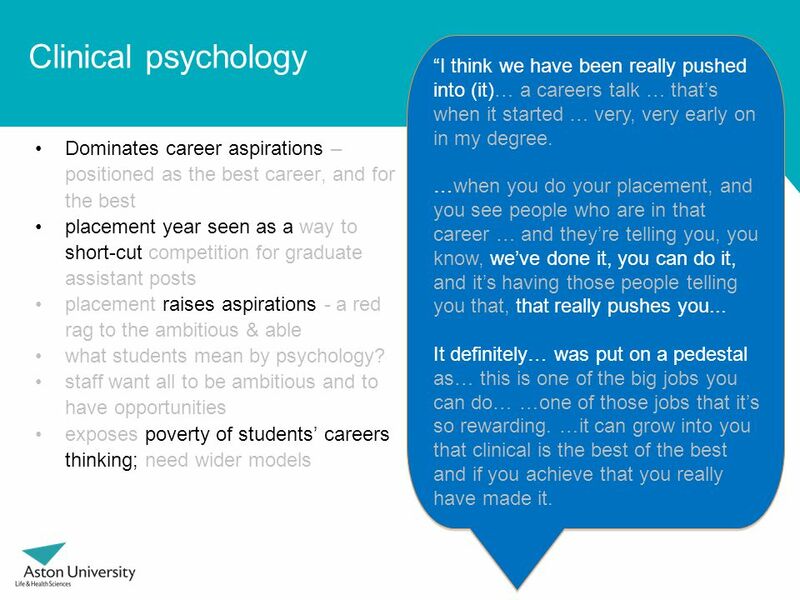 11 Clinical psychology Dominates career aspirations – positioned as the best career, and for the best placement year seen as a way to short-cut competition for graduate assistant posts placement raises aspirations - a red rag to the ambitious & able what students mean by psychology? 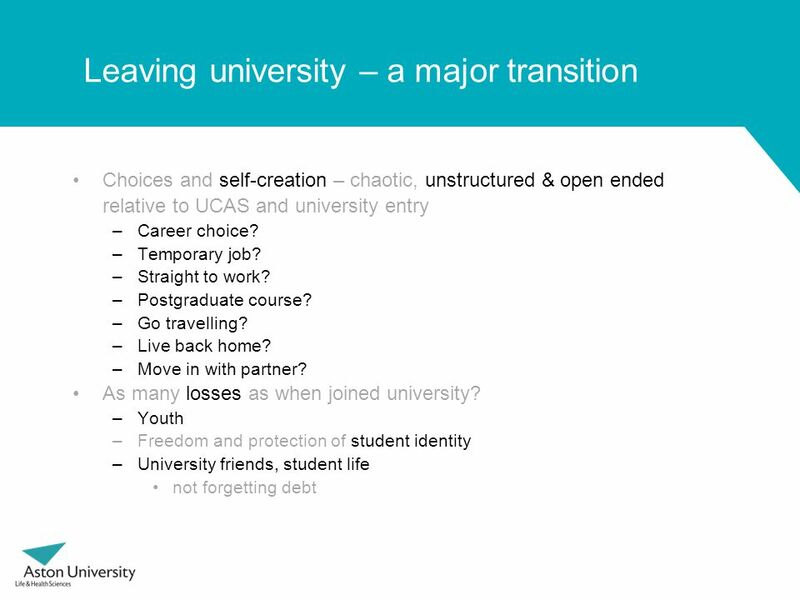 staff want all to be ambitious and to have opportunities exposes poverty of students’ careers thinking; need wider models “I think we have been really pushed into (it)… a careers talk … that’s when it started … very, very early on in my degree. …when you do your placement, and you see people who are in that career … and they’re telling you, you know, we’ve done it, you can do it, and it’s having those people telling you that, that really pushes you... It definitely… was put on a pedestal as… this is one of the big jobs you can do… …one of those jobs that it’s so rewarding. …it can grow into you that clinical is the best of the best and if you achieve that you really have made it. 13 Focus and dedication, proactivity, planning, ambition, attention to detail … I’m working six days so I’m pretty exhausted. I only started last week... When I think of it I did a placement for nine months working at the supermarket two days, working at the placement for four days, so I did six days a week for about nine months so when I think about it, you know, it’s do-able … to get this experience … I started setting this up from August. (Ten months earlier) As soon as I came out of my placement I was out there looking for more stuff. It’s only recently that they recruited some people then I thought they could start my induction at the same time with these people and, also, I didn’t want to be doing this while I had a dissertation and exams and … So actually I’d got my CRB in March … and only got in touch in the exams to say ok I’m finally ready now. She had arranged voluntary work, including her CRB check, months in advance in order to be ready to start as her exams ended. 14 Discomfort with her own competence? Embarrassment that competitor-colleagues are disorganised. 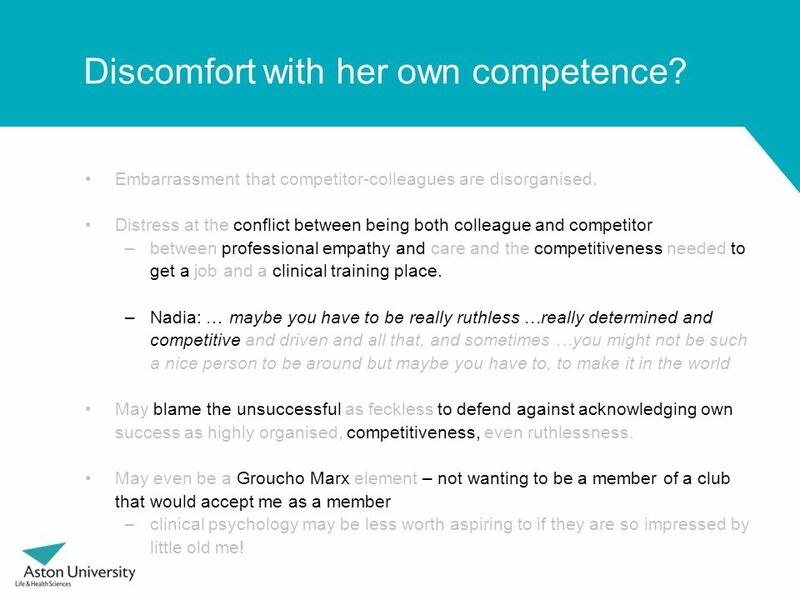 Distress at the conflict between being both colleague and competitor –between professional empathy and care and the competitiveness needed to get a job and a clinical training place. –Nadia: … maybe you have to be really ruthless …really determined and competitive and driven and all that, and sometimes …you might not be such a nice person to be around but maybe you have to, to make it in the world May blame the unsuccessful as feckless to defend against acknowledging own success as highly organised, competitiveness, even ruthlessness. 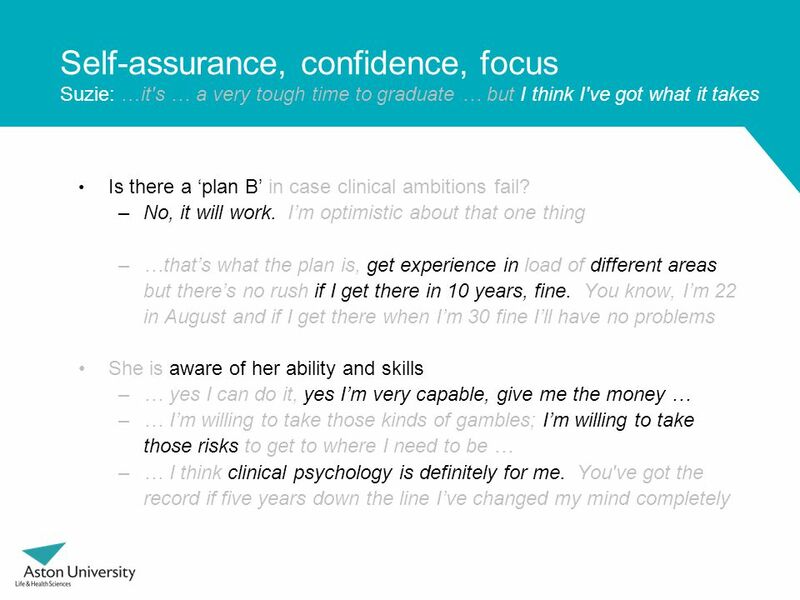 May even be a Groucho Marx element – not wanting to be a member of a club that would accept me as a member –clinical psychology may be less worth aspiring to if they are so impressed by little old me! 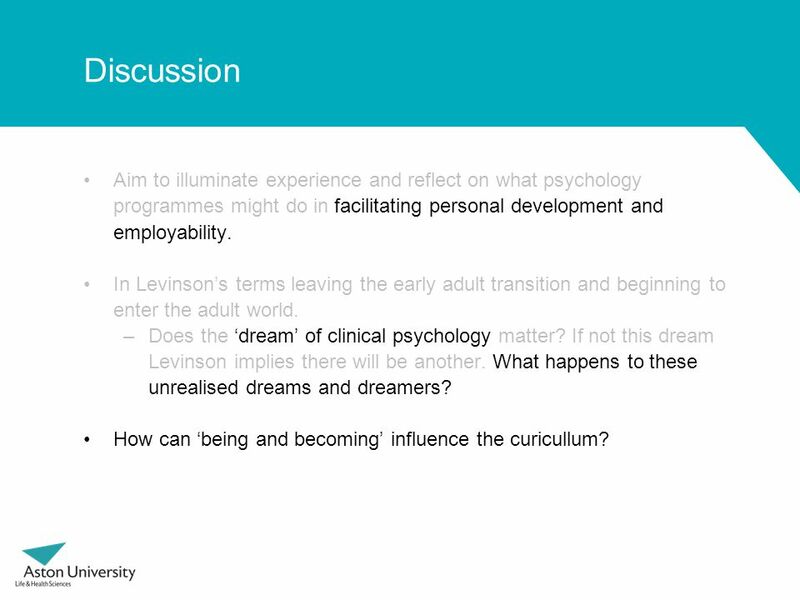 20 Discussion Aim to illuminate experience and reflect on what psychology programmes might do in facilitating personal development and employability. 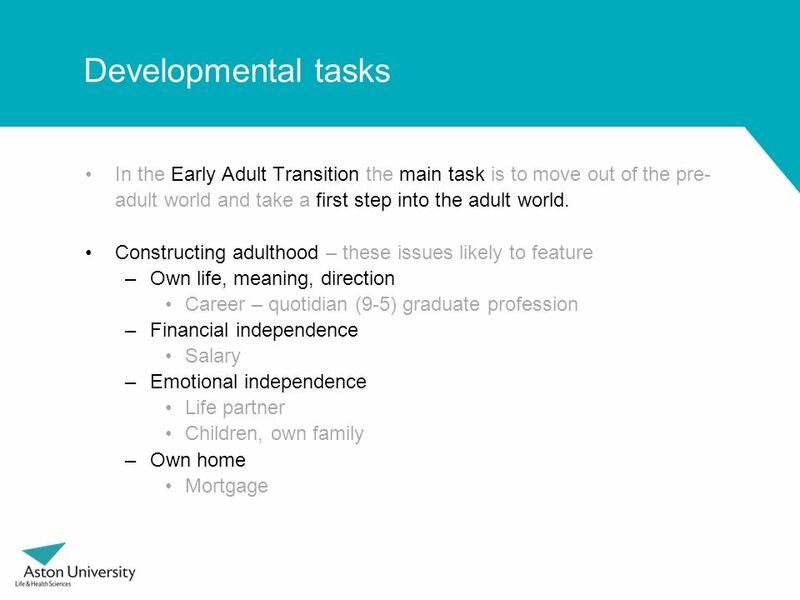 In Levinson’s terms leaving the early adult transition and beginning to enter the adult world. 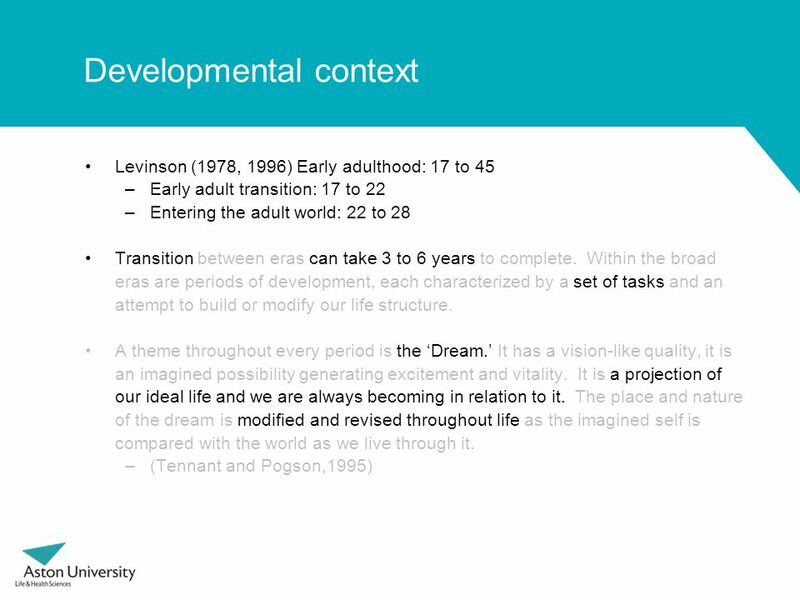 –Does the ‘dream’ of clinical psychology matter? If not this dream Levinson implies there will be another. What happens to these unrealised dreams and dreamers? How can ‘being and becoming’ influence the curicullum? 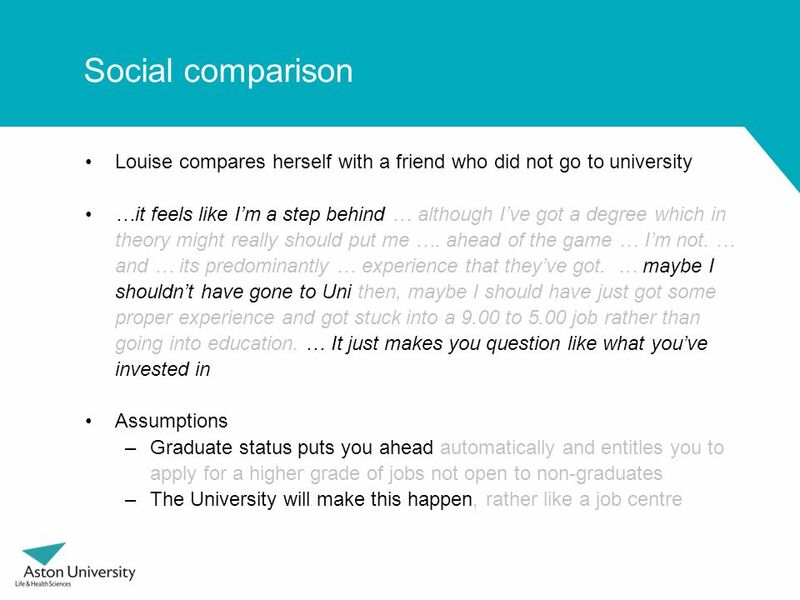 Download ppt "BSc Psychology, preparing for and entering the graduate world Paper 126 HEA STEM Conference, Edinburgh 30 April – 1 May 2014 Peter Reddy, Rachel Shaw and." Business School 1 Module Assistants Berry ODonovan PL Student Experience Business Faculty. Academic assessment of work placement – made easy? It was mid-year, I’d say around November when I would have to face the consequences of a life time. I was off on my own a lot more and having fun. More. A research project funded by the Framework 7 Research programme of the European Union Do we have any success stories to tell? Marta Korintus Andrea Racz. PATIENT SURVEY When you contact the surgery do you feel that surgery staff treat you with respect and are polite and courteous? Counselling Psychology Mindfulness treatment of eating disorders: A qualitative analysis of therapists’ experiences Nadia Mysliwiec & Dr. Mark Thorpe and. Whose Occupational Balance is it Anyway? Strategies for living a more balanced lifestyle Dr Teena Clouston.